“Right, left, pivot.” 83 year-old band director Professor Michael Leckrone hollered at the University of Wisconsin Marching Band as they rehearsed for their Sept. 30 performance at Lambeau Field. The band followed Leckrone’s directions, and their shoes made a “slosh” sound against the wet turf as they stepped into their next position. There was a deluge of rain, but Leckrone and the band continued to strive for crisp, accented moves. The band played the song “Sing, sing, sing” as they trudged through the rain to perform their newest halftime show. Leckrone stayed on the field with them although he was drenched in rain. Because the show was new to the band, many band members struggled to perform the moves exactly as Leckrone had envisioned. The driving rain blurred out most things in sight, but Leckrone managed to find imperfections in the band’s formation with ease. A month earlier, at a practice like today’s but much drier, Leckrone announced to the “Badger Band” that this season, his 50th at UW, would be his last. 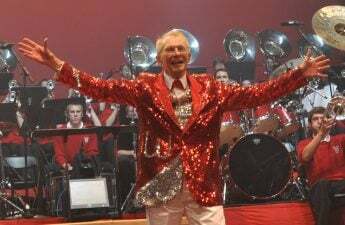 While Leckrone is usually spotted conducting the band’s performances — including the football halftime shows, the fifth quarter and the annual spring Varsity Band Show — his home away from his hometown North Manchester, Indiana lies elsewhere on campus. Leckrone’s office offered a stark contrast from the bleak reality of the Humanities Building. Warm wood paneling replaced harsh grey cement walls; knick knacks and plaques lined Leckrone’s desk and walls, each with a story begging to be told. 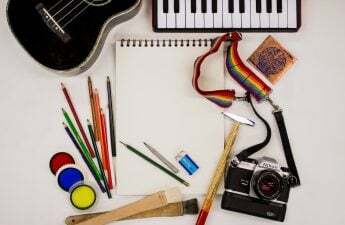 Leckrone and I shared a few laughs over an invoice from Tresona, a music licensing company that recently made the licensing process for educational bands and choirs more expensive and complicated. He notes that while some aspects of the job have become simpler and more efficient with time, such as his flying rigs for the annual Varsity Band Show, others have become more complicated. One thing, though, has remained simple and pure: Leckrone’s love and passion for music. While Leckrone has inspired many UW students throughout his career, Leckrone himself was heavily influenced by his father’s love of music. His father was the local high school band director. He kept a large record collection which Leckrone inherited. Leckrone still owns every record by Bix Beiderbecke, a jazz trumpeter who he remembers listening to with particular fondness. Leckrone and his father would often put on shows in the local community. There, Leckrone experimented with instruments like the trombone and the clarinet. While Leckrone considers himself primarily a trumpet player, he learned he could trick audiences into believing he had mastered all instruments by learning to play simple tunes on each one. The thrill of performing, Leckrone said, drove him to pursue music. 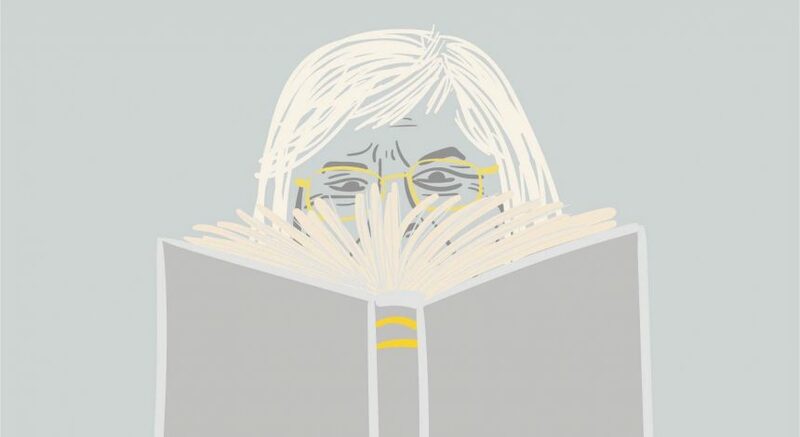 Tucked away behind his computer and multiple stacks of papers, a mug from Leckrone’s alma mater Butler University stands out among a room full of red and white. While at Butler, Leckrone continued his streak as a “jack of all trades” when he received the unusual opportunity to play simultaneously in their classical, jazz and marching bands — musicians normally have to pick a genre to focus on at this time in their career. Butler’s band director retired just as Leckrone finished his training. Inspired by his director’s mentorship, Leckrone started directing the Butler marching band program the fall of 1966. For three years, he directed not only the band but also other musical projects, including the men’s glee club for a period of time. 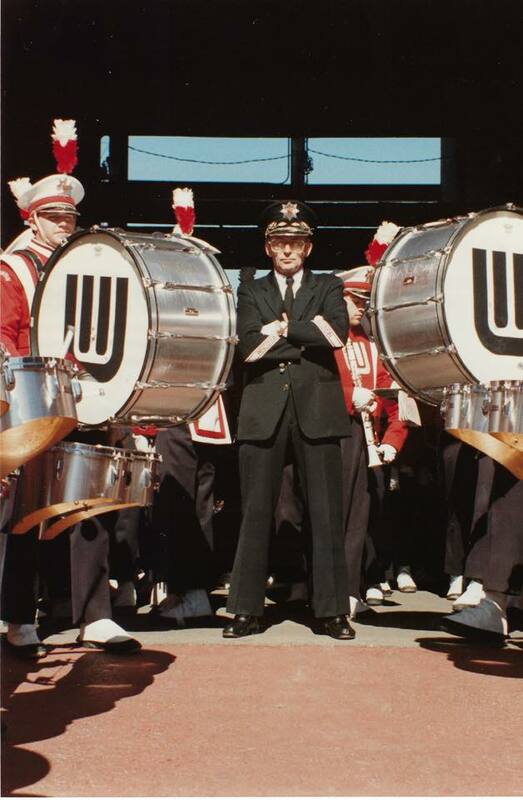 The UW band director position opened up in 1969, when the UW band was lost in a transitional period. UW’s football program was not performing well, so the band did not have an active performance schedule. Leckrone, however, saw a program with immense potential waiting to be unlocked. 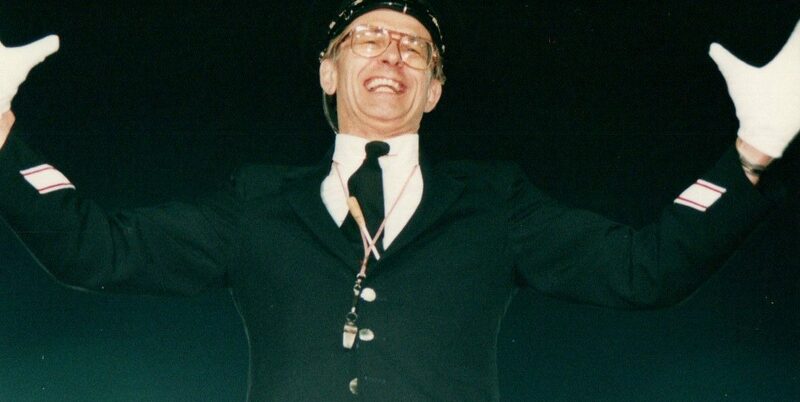 When Leckrone first took charge of the Badger Band in the fall of 1969, he sought to change the band’s character and bolster its confidence by asking its members to perfect drills and performance practices. While he knew it was impossible to perfect a band overnight, he was determined to train the corps to have the most attentive ready-to-play position — “horns up,” in band speak — in the nation. This helped instill a greater sense of pride in the band members. Leckrone also invented Wisconsin’s signature “stop at the top” style of marching, which was modified based on the standard “chair step” style adopted by most Big Ten bands at the time he became UW’s director. These two improvements together brought attention to the band. Soon, interest to join the band increased. Leckrone, too, sought to turn the marching band from a seasonal activity to a year-long involvement. The show sold out its first venue, Mills Hall, in 1976. 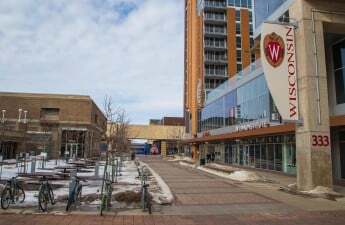 The show then moved to bigger venues to accommodate its growing audience, eventually finding its home at the Kohl Center. As soon as the words came out of Leckrone’s mouth, the band started chanting “eat a rock.” Bands throughout the years have understood the meaning of this phrase. The same pride and dedication underscoring the phrase “eat a rock” also carried through Leckrone and his band until they finally came across the chance to perform at the Rose Bowl in 1994, halfway through Leckrone’s tenure. Though he has since been able to conduct at five more Rose Bowls, he said none of them matched his first outing. 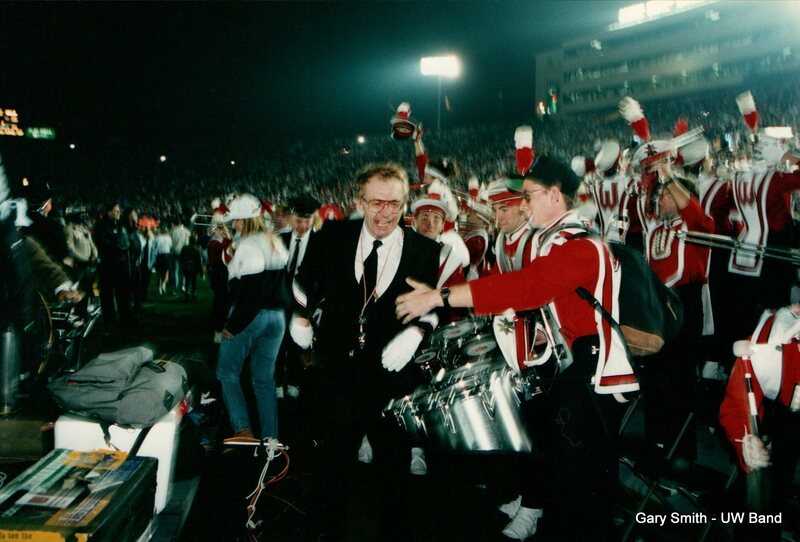 While the band’s Rose Bowl performances are Leckrone’s proudest professional accomplishments, Leckrone himself is perhaps best known for reinventing the repertoire of the UW marching band. Among his legacies is the shortened version of the song “On Wisconsin,” which he created by removing earlier verses to lead the band directly into the iconic “On Wisconsin” chorus that fans continue to sing along with every touchdown. Leckrone wanted to program tunes that everyone would know and enjoy, so he incorporated rock-and-roll style beats into classic songs to appeal to both the older and younger crowds. The band today has a diverse repertoire. While “All Night Long” by Lionel Richie may not be a traditional choice for a marching band set, the UW marching band plays it alongside other classics such as George Gershwin’s “Summertime” from Porgy and Bess. Songs from broadway shows Jesus Christ Superstar and The Music Man are also featured in the current season. Broadway holds a particularly dear place in Leckrone’s heart. He fondly remembers watching different shows at the Great White Way in New York City with his late wife, Phyllis. Tate Warren, a recent UW graduate and Badger Band alumnus, witnessed this love firsthand when a Nor’easter storm grounded a portion of the band in New York City this past spring. Warren was one of many band members who won tickets to see the Spongebob Squarepants musical on the trip. Whereas most lottery winners in the band invited their friends to the show, Warren invited Leckrone. Professional accomplishments aside, Leckrone insisted his proudest personal accomplishments stem from the love of his life, his late wife Phyllis. The pair began dating in the seventh grade and were married for 62 years until her passing last August. Leckrone said she has always assured him that he could pursue his passions with the band, even if that meant he couldn’t be at home as much as some husbands could. When Phyllis passed, Leckrone’s children gave him a ring with her fingerprint engraved on it, which he wears on his right ring finger. On his left ring finger is his wedding band. Unlike his memory for Phyllis, Leckrone believes people’s memory of him will pass quickly because he typically is involved in only four years of people’s lives. 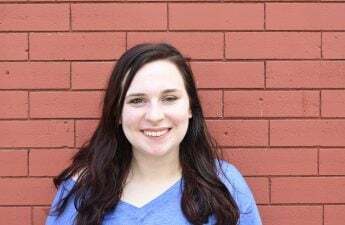 But freshman Kristen Schill said she decided to keep marching in college only after hearing about Leckrone’s leadership from her high school band director, Kurt Dobbeck, a Badger Band alumnus who attended UW in the early 80s upon Leckrone’s encouragement. Throughout his career, Leckrone’s work ethic has been guided by excellence. Although humble about his legacy, Leckrone hopes that the band will carry on his relentless pursuit of perfection. For Leckrone, the key to perfection lies perhaps in the band’s confidence and dedication. But for UW senior CJ Zabat, the band’s drum major, this perfection comes in the form of “moments of happiness” Leckrone has inspired Zabat to pursue on and off the field. Back on the field, the skies began to clear up. The back of the band began to perform to Leckrone’s choreography, which few marching band directors today can say they create by themselves. After running the routine again, Leckrone determined the band was in good shape and dismissed them to hear drum major Zabat’s final message for the day. After practice, members went up to Leckrone to ask questions about spacing in the formation. Another went up to return a bracelet Leckrone had lost on the field. A friend had given the bracelet to Leckrone to help reduce his arthritis. And although Leckrone believes the healing power of the bracelet to be purely psychological, he cherishes it for its sentimental value. The drumline stayed behind to conduct a sectional practice after an already grueling two hours of rehearsal. Their beats can be heard from the bus stop a quarter mile away. Even with Leckrone off the field, his music keeps marching on.